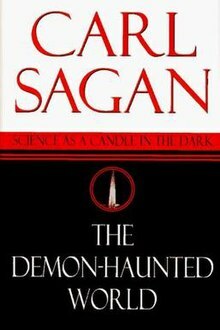 The Demon-Haunted World: Science as a Candle in the Dark is a 1995 book by astrophysicist Carl Sagan, in which the author aims to explain the scientific method to laypeople, and to encourage people to learn critical and skeptical thinking. He explains methods to help distinguish between ideas that are considered valid science and those that can be considered pseudoscience. Sagan states that when new ideas are offered for consideration, they should be tested by means of skeptical thinking and should stand up to rigorous questioning. Sagan explains that science is not just a body of knowledge but is a way of thinking. Sagan shows how scientific thinking is both imaginative and disciplined, bringing humans to an understanding of how the universe is, rather than how they wish to perceive it. He says that science works much better than any other system because it has a "built-in error-correcting machine". :27 Superstition and pseudoscience get in the way of many laypersons' ability to appreciate the beauty and benefits of science. Skeptical thinking allows people to construct, understand, reason, and recognize valid and invalid arguments. Wherever possible, there must be independent validation of the concepts whose truth should be proved. He states that reason and logic would succeed once the truth were known. Conclusions emerge from premises, and the acceptability of the premises should not be discounted or accepted because of bias. As an example of skeptical thinking, Sagan offers a story concerning a fire-breathing dragon that lives in his garage. When he persuades a rational, open-minded visitor to meet the dragon, the visitor remarks that they are unable to see the creature. Sagan replies that he "neglected to mention that she's an invisible dragon". The visitor suggests spreading flour on the floor so that the creature's footprints might be seen, which Sagan says is a good idea, "but this dragon floats in the air". When the visitor considers using an infra-red camera to view the creature's invisible fire, Sagan explains that the fire is heatless. He continues to counter every proposed physical test with a reason why the test will not work. Sagan concludes by asking: "Now what's the difference between an invisible, incorporeal, floating dragon who spits heatless fire and no dragon at all? If there's no way to disprove my contention, no conceivable experiment that would count against it, what does it mean to say that my dragon exists? Your inability to invalidate my hypothesis is not at all the same thing as proving it true." Sagan presents a set of tools for skeptical thinking which he calls the "baloney detection kit". :210 Skeptical thinking consists both of constructing a reasoned argument and recognizing a fallacious or fraudulent one. In order to identify a fallacious argument, Sagan suggests employing such tools as independent confirmation of facts, debate, development of different hypotheses, quantification, the use of Occam's razor, and the possibility of falsification. Sagan's "baloney detection kit" also provides tools for detecting "the most common fallacies of logic and rhetoric", such as argument from authority and statistics of small numbers. Through these tools, Sagan argues the benefits of a critical mind and the self-correcting nature of science can take place. Sagan provides a skeptical analysis of several examples of what he refers to as superstition, fraud, and pseudoscience such as witches, UFOs, ESP, and faith healing. He is critical of organized religion. Sagan indicates that science can be misused. Thus, he is highly critical of Edward Teller, the "father of the hydrogen bomb", and Teller's influence on politics, and contrasts his stance to that of Linus Pauling and other scientists who took moral positions. The book was a New York Times bestseller and is considered to be a very important book by the contemporary skeptical movement. ^ Sagan, Carl (1997). The Demon-Haunted World: Science As a Candle in the Dark (Reprint ed.). Ballantine Books. ISBN 978-0345409461. ^ Sagan, Carl (March 1997). The Demon-Haunted World: Science As a Candle in the Dark (Paperback ed.). Ballantine Books. ISBN 978-0-345-40946-1. ^ Sagan, Carl (1995). The Demon-Haunted World: Science As a Candle in the Dark (Hardback ed.). Random House. ISBN 978-0-394-53512-8. ^ "BEST SELLERS: June 16, 1996". The New York Times. 16 June 1996. Retrieved 17 February 2017. ^ Bernstein, Evan (November 9, 2015). "Happy Carl Sagan Day!". The Skeptics' Guide to the Universe. Retrieved 17 February 2017. ^ Novella, Steven. "NeuroLogica Blog » Carl Sagan Day". New England Skeptical Society. Retrieved 17 February 2017. ^ Meadon, Michael (8 October 2009). "Books IV". ionian-enchantment.blogspot.com. Retrieved 17 February 2017. ^ Swiss, Jamy Ian (9 May 2013). "I, Skeptic". Northeast Conference on Science and Skepticism. Retrieved 17 February 2017 – via YouTube. Ayala, F. J. Ayala (July 26, 1996). "The Demon-Haunted World, reviewed". Science. 273 (5274). pp. 442–444. Bibcode:1996Sci...273..442S. doi:10.1126/science.273.5274.442. DOI: 10.1126/science.273.5274.442. Dembart, Lee (April 18, 1996). "BOOK REVIEW / NON FICTION : For This Scientist, the Truth Is Out There : THE DEMON-HAUNTED WORLD: Science as a Candle in the Dark by Carl Sagan". Los Angeles Times. Gorman, James (April 7, 1996). "Invasion of the Body Snatchers". The New York Times. Schult, Jeff (April 1996). "The Case for Science (Carl Sagan: The Demon-Haunted World - Science as a Candle in the Dark)". American Reporter. Trachtman, Paul (May 1997). "Review of 'The Demon-Haunted World', 'Einstein, History, and Other Passions', 'The End of Science'". Smithsonian. Archived from the original on 2009-09-27.